Three Welsh beaches are in the UK's top 10 after thousands of people scored locations on a review site. Barafundle Beach in Pembrokeshire was fifth overall, with the Gower's Rhossili Bay seventh and Newborough Beach on Anglesey 10th. They are heralded in TripAdvisor's Travellers' Choice Awards, with Bournemouth Beach in Dorset taking the top spot. Rankings were calculated using review scores given by visitors. 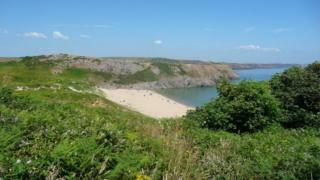 Based on 961 testimonies, Barafundle Beach, in Pembrokeshire Coast National Park, top scored in Wales. Of these, 86% gave it an excellent rating, 11% very good, 1% average, 1% poor and 1% terrible. "This could be the best beach in Pembrokeshire. It could be the best in the world," said reviewer Haydn J, from Llanelli. "Or, more sensibly, it's one of the finest out of the many fine beaches in this wonderful part of the country." It was described as "a total gem" by Gemma A715 from London, who added: "I almost don't want to review this beach so that it can remain hidden." Rhossili Beach on the Gower peninsula was previously named best in the UK and Europe and in the world's top ten, but it is seventh on the list. It had 1,724 reviews, with 87% of these scoring it excellent. MrPotter02 from Hamilton, Canada said: "Don't miss it", adding: "The views are second to none. The photos don't do the area justice." The final Welsh beach to make the top 10 was Newborough, with 86% of 492 reviewers scoring it as excellent. "Have travelled extensively all over the world but this beach has impressed me more than any I've seen," said Linda C from Scholar Green in Cheshire.